While Bugman and I woke up at 5-something am to get dressed and packed and breakfasted in time for the 7 am route opening, we were still getting ready when a cheer went up as the first riders took off. I think we finally got started at 7:45 am. As we waited for traffic to clear (and watched one cyclist fall over – pedal clip fail) , we chatted a bit with a policeman about our bike. Lots of people were interested in our ride, as we were one of maybe a dozen tandems on the ride, and perhaps the only ones with a Rohloff hub and belt drive (which would become significant later). 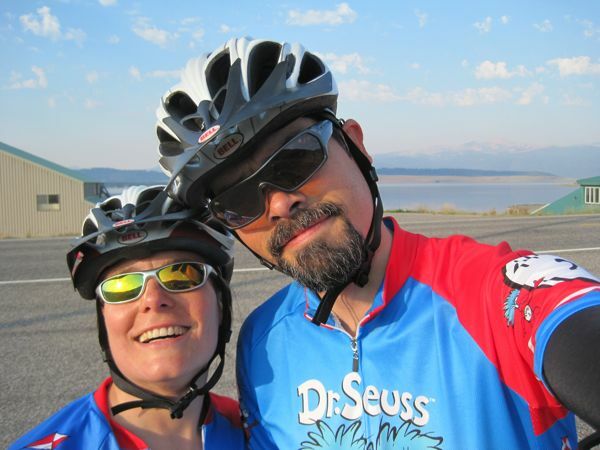 As we pedaled through the cool morning air along Highway 287, I was full-to-bursting with joy. 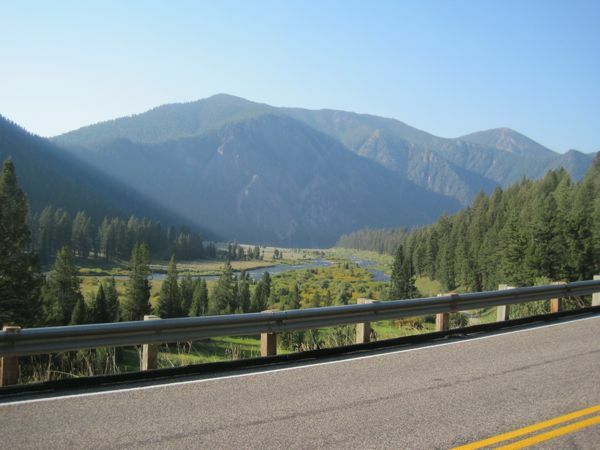 The photos here are simply not going to do justice to the feeling of cycling along with hundreds of other riders, passing pine forest and pasture, inhaling the fresh scent of green things upslope. Our shadow on a bridge over Duck Creek. 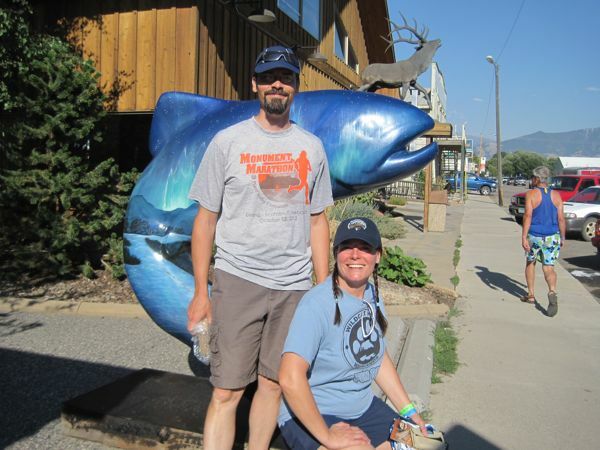 Our Day 1 destination: Ennis, Montana. A selfie at Hebgen Lake. We wore our “Thing 1 and Thing 2” jerseys on the first day and got lots of chuckles. Beautiful view along Hebgen Lake. Couple of guys fishing the Madison River. Gorgeous scenery!! 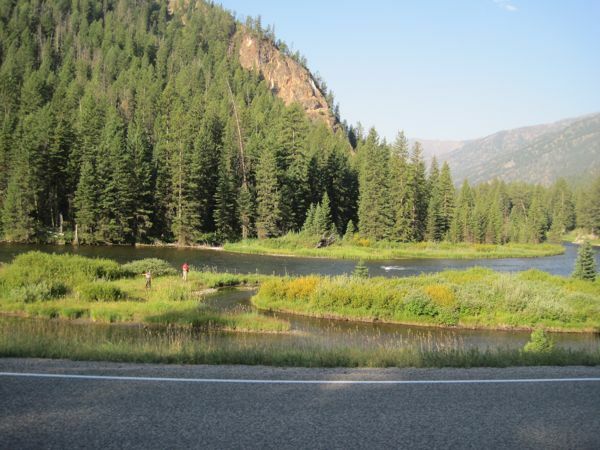 Another view of the Madison River in the Gallatin Range, a touch of wildfire smoke hazing the air. 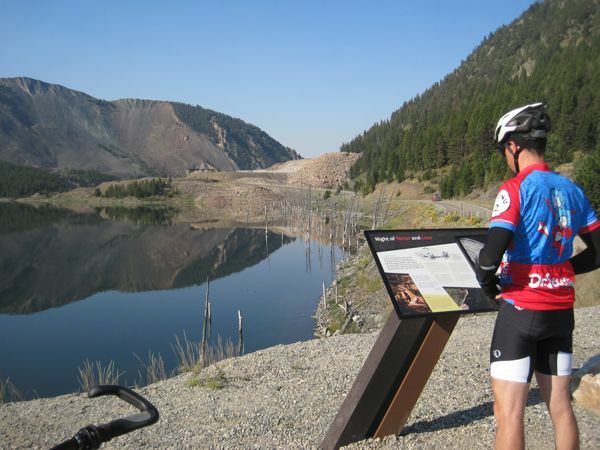 Checking out a sign at Quake Lake, which was created after a 7.3-7.5 magnitude earthquake in 1959 that caused a landslide that killed 28 people and dammed the Madison River to create Quake Lake. The dead trees sticking up around the perimeter of the lake and the bare hillside opposite are testament to the dramatic landscape change. 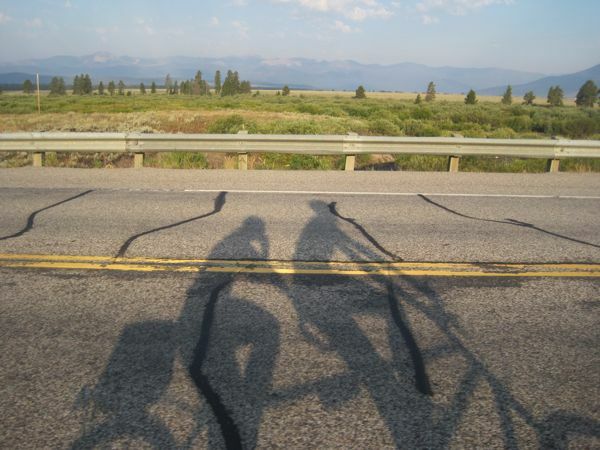 A major portion of our ride was on highways, meaning that we were sharing the road with season-end tourist traffic and other vehicles. For the most part, we all got along pretty well (only witnessed two jerky honkers on the whole trip), but the RVs and two-trailer semi trucks still scared me a bit – particularly on portions of the highway where the rumble strip was set just 8-12 inches from the side of the road, giving us on our tandem less than adequate maneuvering room in case of wind and/or debris and forcing us to ride out on the roadway. Day 1 rest stop at the parking lot of the (temporarily closed) Quake Lake visitor center. 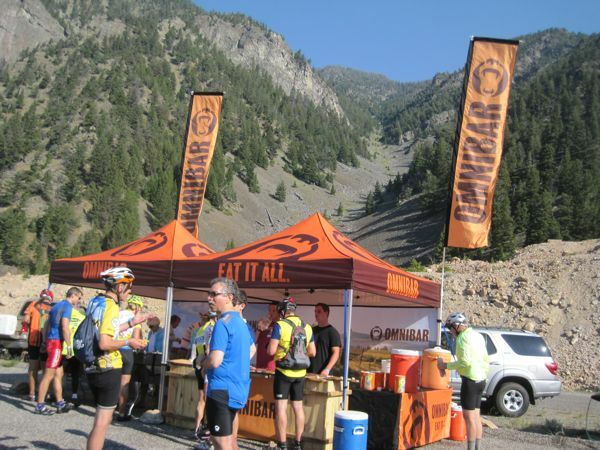 This first stop featured a product from one of the ride’s sponsors: Omnibars – made for omnivores – which contain beef, fruit, nuts, and grains. If I were to give it a tagline, it would be “It’s what bears would eat if they were distance cyclists.” It’s kinda like a fancied-up pemmican. I suppose it’s something I might crave on long cycle trips, since it’s got a little of everything in there. On my personal energy-food edibility scale, I’d put it ahead of Gu but behind a Clif bar or plain ol’ beef jerky. I was more interested by the Nutella-and-banana-on-a-bagel option. 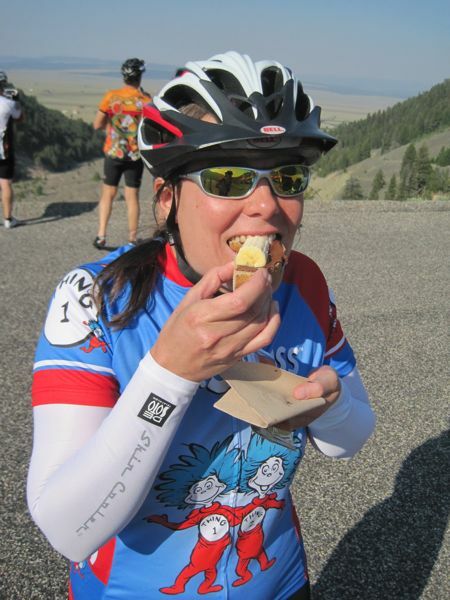 All of our breads on this ride were provided by sponsor Wheat Montana. They make some good stuff! 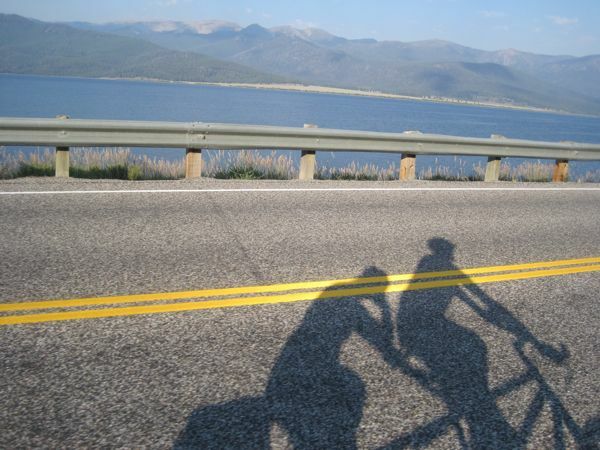 The afternoon’s ride north on Highway 287 was pretty hot – and windy. 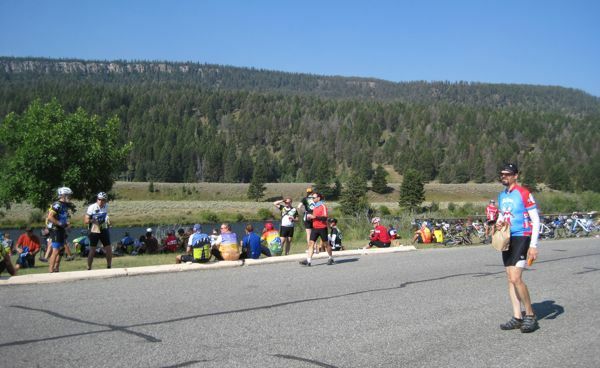 There was significant traffic on the highway and a narrow shoulder, so ranch driveways provided the only non-scheduled water stop options out there. Almost to Ennis, spotted an osprey nest on a pole? 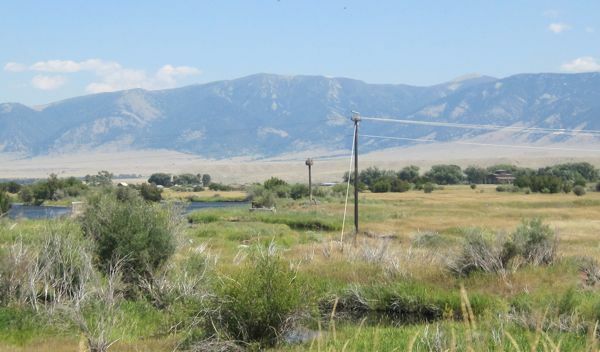 The next nest-on-a-pole, barely visible in this photo, appeared to contain a bald eagle. I sure wish I’d had the camera out when we “crossed the finish line” at the rodeo grounds north of town. 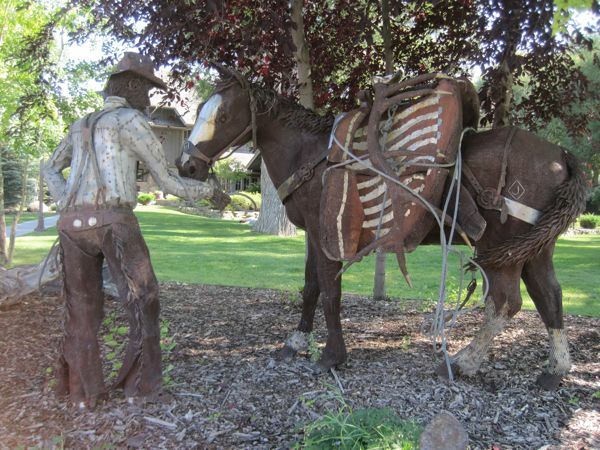 Artistically-painted trout sculptures flanked the finish and students cheered our arrival, as did a lady on horseback clad in a vintage dress (she must have been roasting in that getup!). We found our tent, showered, and worked to set up camp on the dry, rocky ground. But, recall that I had a flat air mattress from the day before. (Bummer!) I flagged down a volunteer on a golf cart to ask if there was some water nearby where I could submerge my air mattress to find the leak. The woman thought for awhile, and said that she couldn’t think of a place, but that she would be happy to take the mattress home with her and find and patch the leak, and if she couldn’t patch it, she could loan me a mattress. Later that evening, I came back to my tent to find a loaner air mattress and a note with a phone number and address. I called the number. The lady said she hadn’t found a leak in the mattress, but was keeping it blown up overnight to be sure. I was welcome to use her mattress that night. I could find her in the morning at the baggage truck to get my mattress back, but I could keep her mattress and mail it back to her at the end of the ride. Without that loaner mattress, there is no way I would have gotten a good night’s sleep. 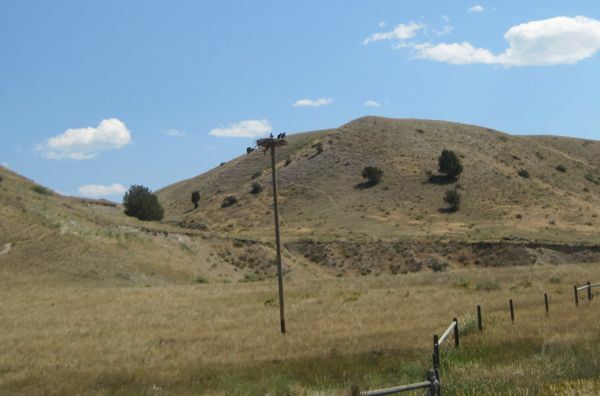 God bless Pam B. of McAllister, Montana! 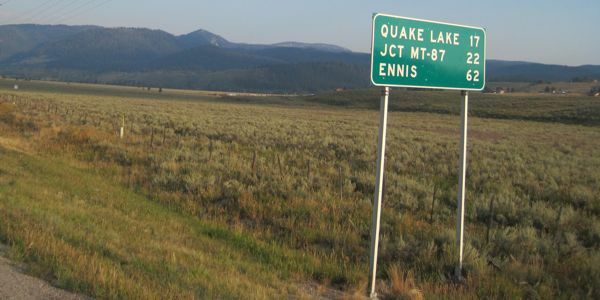 Getting back to Ennis camp . . . we purchased an iced chai from a vendor and cookies from a charity booth, stopped to talk to a community representative about the bike paths planned in the area, then caught a hayrack ride from camp into the downtown. Lovely little downtown, Ennis has. Do you suppose Ennis is the only place in the world with a park featuring a metal sculpture of a man hauling an elk carcass on horseback? 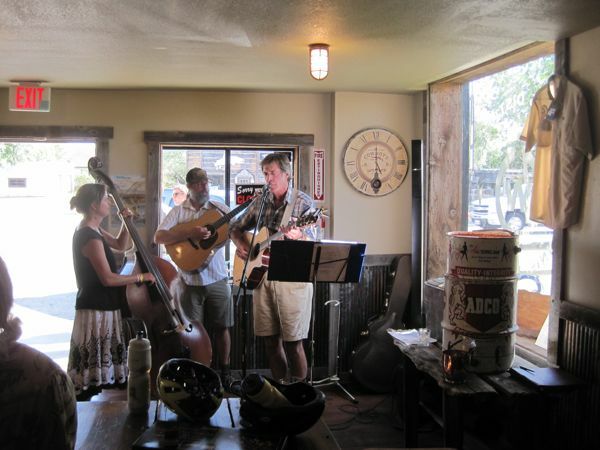 Stopped in at Willie’s Distillery for a bourbon-and-ginger-beer and listened to the music. One of the trout sculptures downtown! Back at camp . . . 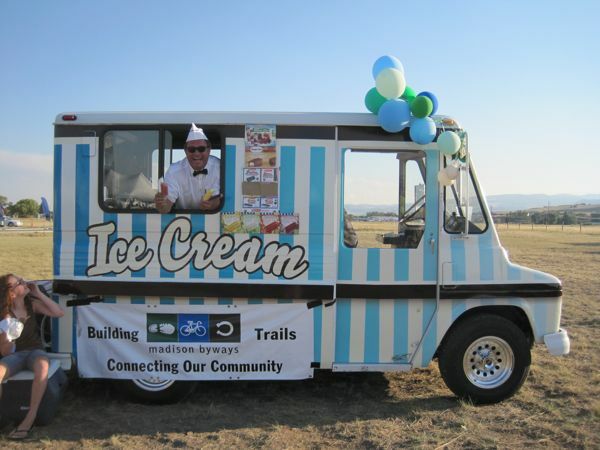 This has to be one of my favorite photos from the trip: an ice cream truck out in the middle of nowhere. The truck driver was very eager to pose for the photo, making sure to don his hat and dig out one of every flavor of popsicle to display. 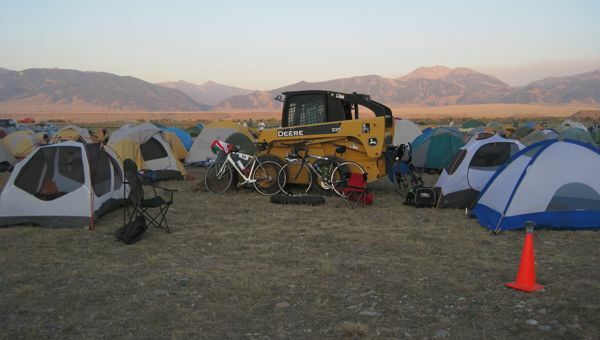 Yet another use for a skid-steer: bike parking. 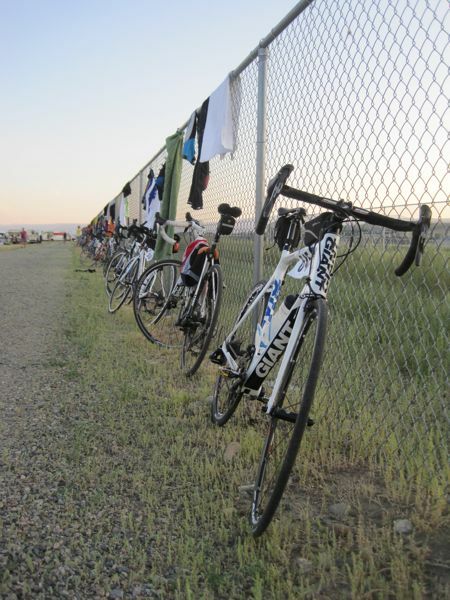 A nearby fence was handy for both bike parking and drying laundry. 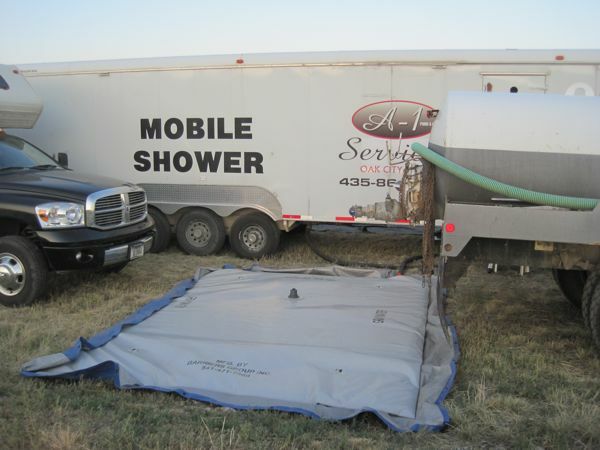 Interesting how the gray water from the shower trucks was handled: it went into a giant bladder, which then was apparently siphoned dry into another truck?